Back when I was single I used to play squash. Not very well, but I played. I played after squash too. We all did. Belonging to sporting club was a necessary adjunct to life back in the days when the pubs closed at six. The clubs adhered to no such closing regime and stayed open till late so you could refresh yourself after a gruelling game of whatever it was you were playing. The police turned a blind eye to after hours trading most of the time but had to make a raid on the odd occasion to keep their hands in. One week it might be the Blairlogie or the Taueru (two pubs on the road to the coast; both suspiciously burnt to the ground after the introduction of ten o’clock closing) the next week, a luckless sporting club. Getting caught drinking after hours carried no life sentence other than eternal shame to your family. In the sixties major crimes of the times were jaywalking, bookmaking and unlawful carnal knowledge; the latter now seemingly expunged from the lawbooks for some reason completely unknown to me. We visited other squash clubs from time to time to play in competitions and then invariably to join them in a social cabaret on the Saturday night of the tournament. One such outing was to occur in Palmerston North and a friend and I and our girlfriends decided to give the tournament itself a miss but attend the Saturday night function. The event was to be a fancy dress. It occurred to us that if we were to arrived dressed as policeman, given that the illegal bar would be in full swing, we might just create pandemonium. 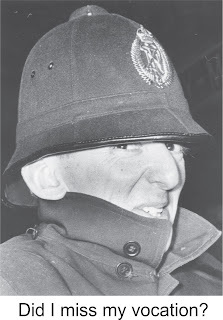 There were no costume hire companies in town in those days so on Friday night I went cap in hand to the Masterton Police station and asked if I could borrow a couple of uniforms for the following evening. Back then the tiny police station was on the corner of Lincoln Road and Church Street. I think the total compliment of police personnel was about five or six and the CIB section served the whole Wairarapa. I was politely told by the pleasant gendarmes manning the station that it was illegal for them to lend out uniforms. This was Brian Maude and Geoff Russell and they seemed genuinely sorry that they couldn’t help. I was about to walk out when they had a curious change of heart. Over the road quite a large crowd was gathering outside the car company known as H. J. Jones Ltd. McKenzie Flooring now occupies the site. The friendly Austin/ Morris dealership was owned and operated by likable brothers Les and Eric Jones, both sons of the original owner: “H.J.” A Wairarapa Car Club Rally was leaving from the premises and had drawn a crowd of well over a hundred people who were taking up the footpath adjacent to where the cars were leaving from and had spilled on to the road. Passers-by were having great difficulty passing by. My two gregarious police persons said I could have the uniforms if I put one on now and went over the road and dispersed the crowd. It seemed like a fair swap to me so I donned a navy great-coat (it was raining) put on the helmet and marched over to the madding crowd feeling somewhat drunk with power. “Move on” I said in the best PC Plod manner I could muster and moved the crowd back from the footpath edge allowing those wanting to use the footpath as a footpath an uninterrupted passage. I enjoyed the experience. Never before had so many people been so moved by so few in such a short time. With apologies to you know who. I looked back at the station and saw constables Russell and Maude peeping over the half white painted windows with sheer admiration written in their expressions. I suspect their mouths, which were hidden, would have been in the wide grin mode. All would have gone swimmingly to plan if someone hadn’t recognised me. That someone was Jack Jenkin, some years previously he had been my scoutmaster and he told me later he would not have known it was me except I was wearing pointed toe shoes. We used to call them winkle pickers. Fashionable for young men at the time, but hardly the attire for a policeman on duty. He cried out for all to hear: “It’s bl*#@y Ricky Long!” using language that would have made Lord Baden-Powell blush and the crowd swarmed back to their previous untenable positions. Mob rule returned to the streets. When I told them it was the Times-Age photographer the colour drained visibly from their cheeks. 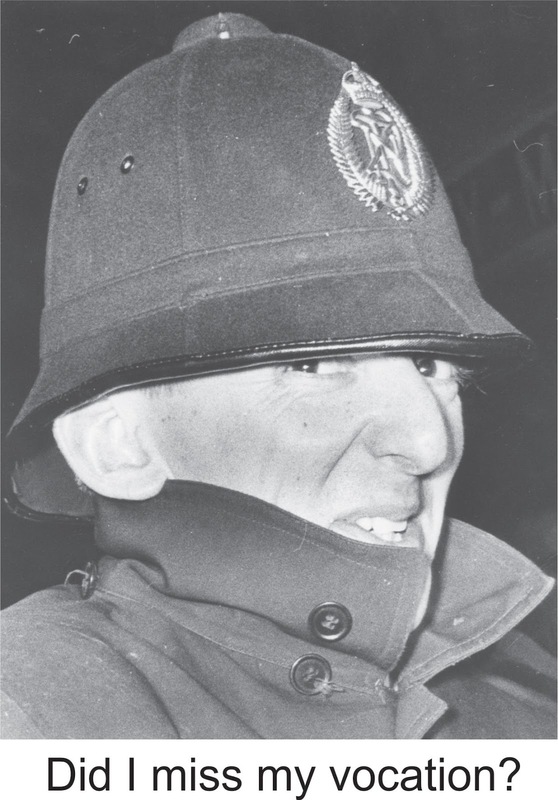 Lending a police uniform was a sackable offence. If the picture was published they could both lose their jobs. I was reminded too that my own role was a hangable felony, or something akin to that. I was sorry I had placed us all in such a position. They invited me back to the station at nine the next morning to see if the three of us could somehow convince Norm that it would be in everyone’s best interests not to publish the photo. By the time I got there the hapless photographer had been interrogated under a powerful white light in a darkened backroom that didn’t really exist and had reluctantly handed over the negative and the print. There were no distinguishing marks on his person to suggest that the photos had been beaten out of him. I suspect he had probably been promised an exclusive scoop on the next major crime in the town as a reward for his co-operation. This would likely have been someone caught double-parking. Anyway Norm was his usual cheerful self as he left the station and seemed not too phased at having lost the opportunity to print the picture. Messrs. Maude and Russell kept their end of the bargain and handed over two uniforms and at Palmerston North that night we had even more fun which will be the subject of next week’s column. I found the offending photo the other day during our house shift and thought that forty years on the Times-Age might at last like to publish it at last. I met Brian Maude last year at a Licensing Trust conference in Auckland. He is now retired from the force and is a board member of a major trust in that city. I assume Geoff Russell has also retired, so there should be no repercussions. Unless of course, Police minister George Hawkins decides to withdraw their pensions. Meanwhile I’m relying on the likelihood that the statute of limitations for being charged with impersonating a police officer will have well passed.